The B410P features on-board DSP-based echo cancellation and supports TE and NT mode over 4-wire S/T interface. Using Digium's digital hardware, Open Source Asterisk PBX software, and a Linux PC, users can create an intelligent telephony environment which includes all the sophisticated features of a high-end PBX/Voicemail platform. The B410P is a half-length, full-height universal 3.3V and 5.0V 32-bit PCI 2.2 card supporting four BRI S/T interfaces. 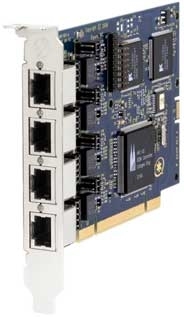 Each of the four ports of the B410P can be independently configured for TE or NT mode. The B410P features on-board hardware echo cancellation performing 64ms or 512 taps per channel for each of the eight voice channels.